HHC's current earnings do not support the company's valuation. The strategic assets that would determine the future acquisition value of HHC are speculative and may not necessarily be supported by fundamentals. Upside potential for the stock is limited in relation to downside risk and other opportunities in the market. Operating Assets -15 retail, 28 office, 8 multi-family, 4 hospitality properties and 10 other operating assets and investments. MPC (Master Planned Communities) - 80,000 gross acres of land with approximately 10,543 salable acres of land that is generally sold off to developers and homebuilders. Strategic Developments - 29 development or redevelopment projects estimated to cost $3.5 billion, of which $1.7 billion has already been spent. Currently, the company is trading at a market capitalization of $4.8 billion and an enterprise value of $7.6 billion with a forward PE and EV/EBITDA ratio of 36 and 32. HHC has a price to book of 1.5 and a price to tangible book value of 1.53. If a value investor were screening for stocks using traditional metrics, it would be very difficult for HHC to show up. However, this is how some good stocks get overlooked. Traditional metrics do not necessarily tell the whole story. HHC is considered by many of its bullish investors to be a misunderstood stock due to the complexity surrounding its MPC business and the remaining opportunities waiting to be released from the completion of specific strategic assets. Essentially, the thesis is that the significant amount of land that was purchased a long time ago and which is now being carried on HHC’s balance sheet at prices well below market value, will continue to appreciate over time and provide a reliable source of high-margin income. This land will appreciate with inflation whether they continue to sell the land into the market, or hold off if prices temporarily take a dip. The other part of the thesis is based on key assets that are considered to be in a redevelopment/construction stage like Seaport and Ward Village. Seaport is a fashion/dining/entertainment area in New York that is partially being reconstructed and under redevelopment. Ward Village is a development project in Honolulu that includes condo buildings, homes, restaurants and retail. Both locations currently are undergoing a lot of construction and are anticipated to provide additional earnings in the future that is disproportionate to what is being priced into the stock today. One way to evaluate HHC is to determine if the underlying net assets on its balance sheet are worth more than what the company, in its entirety, is trading for right now on the market. If you believe that these assets are worth more than that amount, you should also be fairly confident that there is a reasonable way for them to liquidate the assets in an acceptable time frame. Assets on a company’s balance sheet can be very undervalued because they have failed to be fully monetized. This can be the case in tech, pharmaceuticals, consumer staples as well as real estate. Currently, HHC is trading at around 1.5x its recorded book value. So, HHC’s assets would have to be at least worth an amount that would fill that gap between book value and market cap to make it a worthwhile investment. But as value investors, we also like to work with a margin of safety so it is likely that we would want to be fairly confident that those assets are worth even more than the amount to fill up that 1.5x discrepancy. Two problems persist in evaluating HHC as an asset play though. One is that figuring the market value of huge parcels of land can be very difficult because there are usually so few potential buyers if they decided to sell the whole segment. Most public companies are very hesitant to fork over capital, or take on debt to buy land that does not directly tie into future earnings growth. In shareholders' minds, this would be tying up capital that would have been better off being returned to shareholders. However, much of this land owned by HHC is a legacy which the company has held on to since its inception and as opportunities have come up to sell/develop, they have done so. But waiting to develop has been their only option because it would have been always difficult to sell all the land at any reasonable price. It makes more sense to value this based on cyclically adjusted owner's earnings. 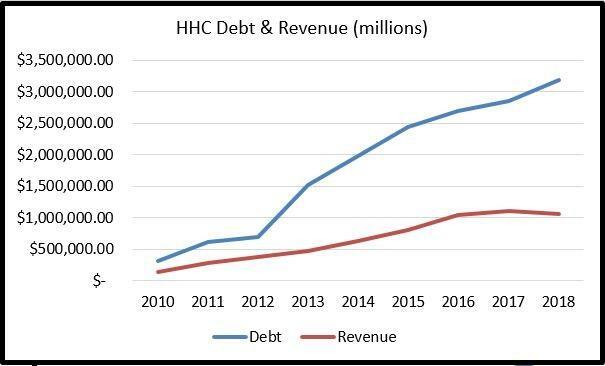 To justify HHC's market price today, you would expect for it to have around $350 to $400 million of owner's earnings per year and, at least right now, that is not the case. If that is not the case now, to remain bullish, we would have to assume that it will be the case in the future. Earnings before taxes for HHC’s MPC division were $202 million in 2018 before accounting for their allocation of consolidated corporate overhead of $209 million (Source: 2018 HHC SEC 10-K Filing). From an owner's earnings perspective, I would estimate that the annual range for the MPC segment probably falls somewhere close to $125 million-$150 million. By applying a multiple of 12, you get a value between $1.5 billion and $1.8 billion. 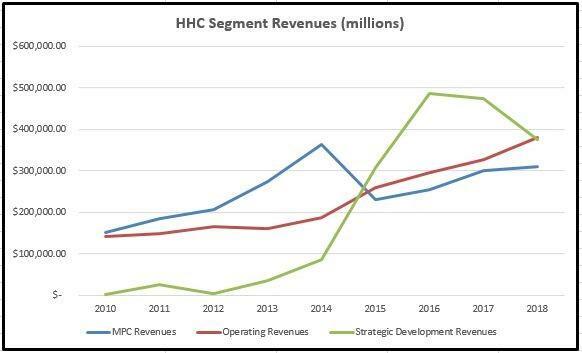 The second problem in evaluating HHC is trying to figure out with some certainty what their operating and strategic assets are worth due to their uniqueness and not knowing what its overall future earnings potential might be. 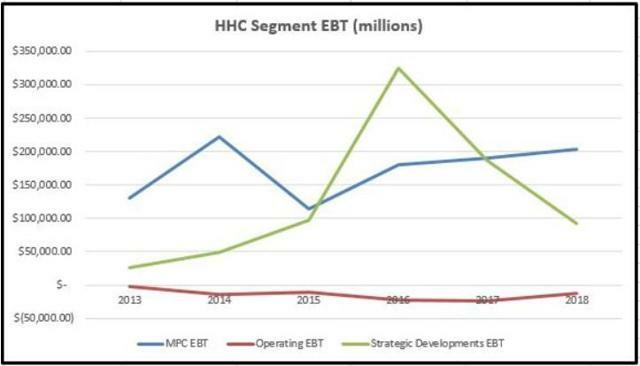 Earnings before taxes for the combination of HHC’s operating and strategic development divisions came to $79 million in 2018 before applying their allocation of corporate overhead of $209 million (Source: 2018 HHC SEC 10-K Filing). If we apply the remaining overhead to these divisions, it brings their owner's earnings into negative territory. This type of result can change in the future but an investment case becomes more of a speculative bet rather than one that is based strictly on fundamentals. In order to attach a theoretical acquisition value to the operating division, I will take the anticipated total assets upon completion of the strategic projects and apply a modest return of 5% to determine anticipated/potential owner's earnings to the business. This would equate to $265 million of earnings and a value of $$3.9 billion using a multiple of 12. This brings a total value for the company to between $5.4 billion and $5.7 billion which is a 12%-18% premium over today’s market cap. Based on this, the best I can say right now is that HHC is a fairly priced stock with potential for some upside with the completion of their strategic assets along with some risk of short-term cyclical downside if housing takes a hit. The Seaport asset has been described by HHC management as an “iconic and irreplaceable part of Manhattan that cannot be recreated” (Source: Q4 HHC Earnings Call). If they ever decided to sell the property, they have said it would likely get an offer that would be normally considered unrealistic in relation to its normalized cash-generating abilities. While I can see this to be true because there a few businesses that abide by emotional and unrealistic valuation formulas in relation to earnings power, it is probably not a good way to consistently operate as a value investor over time. If I take a page out of Berkshire Hathaway’s (NYSE:BRK.A) (NYSE:BRK.B) annual report, I am looking at HHC’s valuation as the combination of a few groves in a forest. At this time, it does not seem to me that the groves of HHC add up to something where I have a lot of certainty of it being worth significantly more than its current market cap. I do not currently have a position in HHC nor do I plan on initiating a new one in the near future at current price levels.